Sunday August 18th 1878 I felt badly this morning and did not go to church. Mother went and I stayed and got the dinner. I read a little in the afternoon and in the evening put up some black-berries that father got today. Went to bed very early. 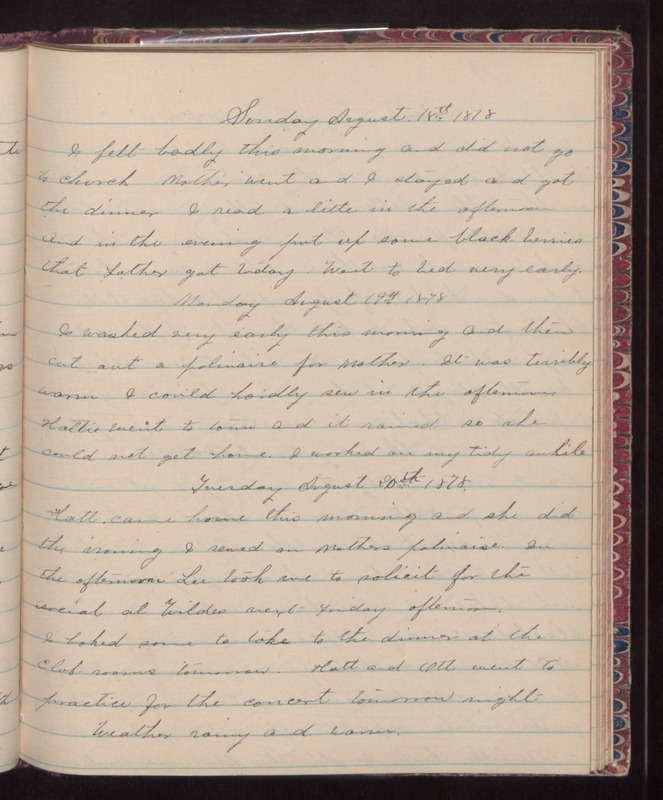 Monday August 19th 1878 I washed very early this morning and then cut out a polinaise for Mother. It was terribly warm. I could hardly sew in the afternoon. Hattie went to town and it rained so she could not get home. I worked on my tidy awhile. Tuesday August 20th 1878 Hatt came home this morning and she did the ironing. I sewed on Mother's polinaise. In the afternoon Lee took me to solicit for the social at Wildes next Friday afternoon. I baked some to take to the dinner at the club rooms tomorrow. Hatt and Ott went to practice for the concert tomorrow night. Weather rainy and warm.